Myles H. Kitchen of Aptos, California (on the north coast of California, near Santa Cruz) sent the following text and photographs. 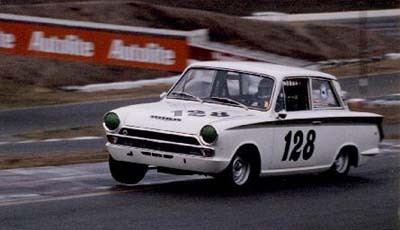 "This particular Lotus Cortina BA74ED59984 was manufactured in October of 1965 as one of approximately 1,000 built that year. 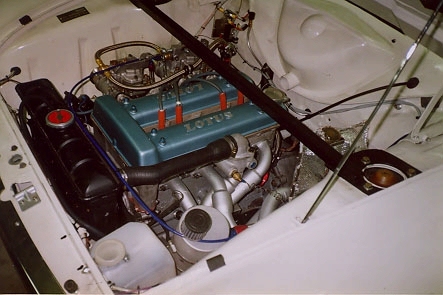 Of course, it carried the characteristic Ermine White with Green Flash color scheme that all Lotus Cortinas wore upon leaving the factory at Cheshunt, Hertfordshire. This car was one of the Mark 1, Series 2 "airflow" models with left-hand drive destined for the North American Market. I believe that this car was first sold in Florida, then spent time in Texas and San Diego, California before I bought it. As one of the later examples of the Mark 1 cars, this particular car did not carry the alloy body panels, nor the troublesome "A"-frame rear suspension components of some of the earlier, European models." "The car was advertised for sale in the summer of 1987 in "The Wheel", the publication of the San Francisco (California) region of the SCCA. It was offered for only $2500, had an awful two-tone brown paint scheme, and had the original Weber head replaced by the Stromberg version (The original Weber head was found in the trunk, sans the 40DCOE carbs). I purchased the car sight unseen, as it was a good candidate for vintage racing. Nearly everything would need to be restored and refurbished for racing anyway. It was an eventful drive home from San Diego, as the car barely made it past San Clemente when the Strombergs decided to stop mixing old dinosaurs with the ocean mist. This became a regular occurrence during that trip north to the San Francisco Bay Area (home). A stop in Santa Barbara was mandatory in order to pay a visit to Dave Bean Engineering (a Lotus parts supplier who has since relocated to Plymouth, California) to stock up on just about everything they had that fit the Cortina." "Immediately upon getting #128 home, it came apart....literally every nut and bolt. Upon inspection, it needed major help. The right- side body panels were wavy from a previous heavy impact and lots of subsequent bondo. The steering had about 180 degrees of free-play, the transmission sounded like a 55 gallon drum full of rocks, rolling downhill, and the English electrics offered only two modes, dim and flicker. The wiring harness had complete sections melted down." Bottom end Modifications from stock: Billet crank, steel Cosworth rods, steel main caps, custom 13.5:1 pistons. Cylinder Head Modifications: Head flowed. Unique intake cam profile. Custom exhaust header. Lubrication Modifications: High capacity oil pump, extra capacity wet sump, with baffles, trap-doors and scrapers. Built by Al Burtoni, V-12 Engineering in Gilroy, California. 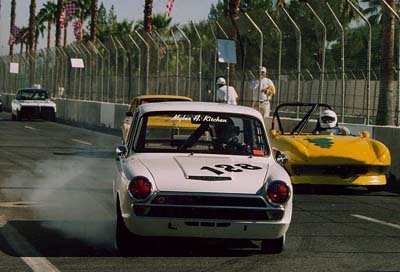 "Photo on left, shows the car coming into the corner a bit too hot at the 1995 Palm Springs Grand Prix. What a weekend! Won my race, made it on ESPN, and had my first date with my now wife Donna! On the right, the car is picking up a front wheel again in Turn 2 at Sears Point Raceway. Below, lifting more wheels in the Festival Corners, at Portland International Raceway, in Oregon." "Ooops....I was running second when the Locort decided to go "grazing" on one of the hay bales at Steamboat Springs, Colorado." The "Hay Bale Incident" at Steamboat occurred when Myles was running a Saturday qualifying race for the small bore production group. 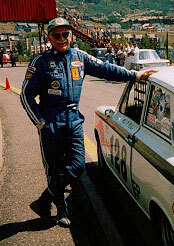 Starting near the back in a large group of nearly 40 cars, Myles had managed to get to second place, chasing the fast little red Datsun Roadster driven by Rich Banks of Park City, Utah. During the race, while running in second spot and gaining on Banks, Myles came into Steamboat's notorious turn 3, a sharp right hander where two city streets make a 90 degree intersection. The outside of turn 3 was a row of hay bales, designed to prevent errant cars from continuing into the deep drainage ditch beyond them. 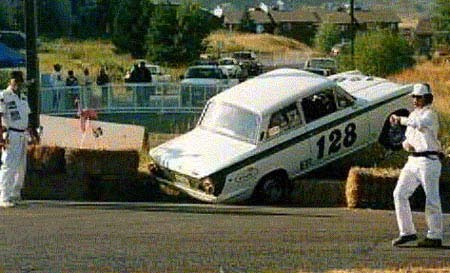 As Myles came into the corner a bit too hot, he locked the brakes and slid just off the course and up onto the first hay bale, where the car high-centered. Myles was stuck with the Cortina at a precarious angle with all the wheels off the ground, unable to back off or continue. 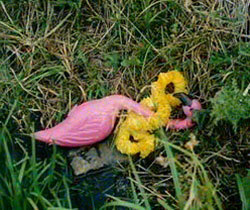 The only damage was some mild rearrangement to the front and rear valance panels of the car, a bruised ego to the driver, and the unfortunate demise of the turn 3 corner worker's plastic pink flamingo that was perched guarding the hay bale! Once freed, Myles was easily able to qualify for the Sunday race, but starting at the back of the grid in 38th position. Myles earned "Hard Charger" award on that race day, for making it back up to 7th, again within site of Rich Banks' Datsun, who finished 2nd.